You must be a member of the Madrid Photography Group to attend this activity. Would you like to join this group? The works at the exhibition come from diverse Spanish and European private collections, gathered exclusively for this show, and which together offer an ambitious and complete tour of the thoughts of the master of surrealism, for his extraordinary creativity and for the themes he tackled and reflected in his work during his professional career. The exhibition, which includes more than a hundred pieces, has managed to compile a careful selection of photographs and a large representation of objects, which will surprise the visitor extraordinarily. These objects were baptized by the French poet Robert Ribemont-Dessaignes as "dream objects", because they are located halfway between memories, dreams and desires. It is precisely on this road where this exhibition is located, and this is reflected in the title of it. The six sections that make up the show draw a unique journey through the dream world of the artist. In them we can contemplate, in addition to his known "impossible objects", works as iconic as his famous rays, his disturbing mannequins or "poetic machines" that reflect the close relationship and complicity between the artist and his great friend Macel Duchamp. The artist, of course, is Man Ray, pseudonym of Emmanuel Radnitzky (Philadelphia, United States, Protected content , Paris, France), an American modernist artist who spent most of his career in Paris. He was an important contributor to the Dadaist and Surrealist movements, and recognized for his avant-garde photography, and his portraits. 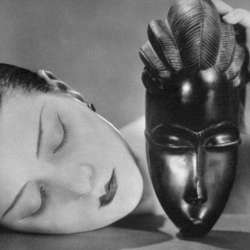 The exhibition surprises the visitor not only for his photographs, such as that of the French model Alice Prin, also known as Kiki de Montparnasse, with the ebony mask, which makes the viewer feel that the two figures share the same dream; but also for its objects halfway between memories, dreams and desires. The perfect opportunity to get lost in the artist's world with other works as iconic as his famous rayos, disturbing mannequins or "poetic machines" that reflect the close relationship and complicity between his friend and artist Marcel Duchamp, to both of whom the great Dalí joined in many times. Do you feel attracted by this new proposal? Then hurry and join us! As usually, afterwards we may go and have a nice conversation while drinking something in the surroundings.